Elise Jameson is the secret author behind the bestselling, cult hit Viking Moon series. But when a stranger poses as Elise, the painfully shy, deaf nineteen-year-old starts to see how much she's missing. Can she really hide in the shadows forever? This clever, coming-of-age debut is for anyone who has ever felt unsure in her own skin. After a freak childhood accident leaves her deaf and physically scarred, nineteen-year-old Elise Jameson retreats into a world of vibrant characters she creates on her laptop. She is shocked when her coping mechanism turns into a career as a phenomenal bestselling novelist. Fans are obsessed with Elise's Viking Moon series and its author-a striking girl with zero resemblance to Elise who appears on the back covers. Elise sent the randomly Googled photo to her editor following a minor panic attack. Now, horrified to learn she is expected on set of the television pilot based on her novels, Elise tracks down her anonymous stand-in. To Elise's surprise, Veronica Wilde has been taking credit for Viking Moon for years. She eagerly agrees to keep up the charade if Elise will pose as her assistant. 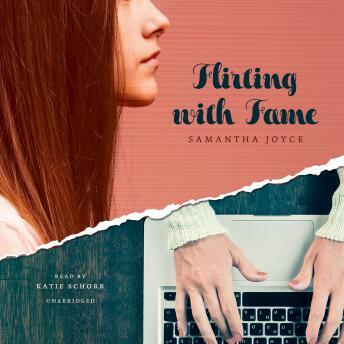 It's hard for Elise to watch a stranger take credit for her work and get all the perks she desires, including admiration from the show's heartthrob star. Edged onto the sidelines of her own life, Elise reconsiders her choice to stay anonymous. Is she ready to come to terms with her true identity-and with the long-buried secrets that could cost her her career, her fans, and the few precious friendships she's made?